Synopsis: When a fur trapper is viciously attacked by a bear and left for dead by his men, he sets out on a quest for revenge against them who left him to die. Review: From a story about a man who was a washed up superhero trying to put on a Broadway play in one year, to a chilling tale of revenge for another man in the 1820s, it is quite the contrast for Mexican director Alejandro González Iñárritu. His 2014 effort Birdman for all its eccentricities, won the director three Academy Awards. Yet he surpasses himself with this true story, about one man’s fight for both survival and vengeance in equal measure, and with a whopping total of twelve Academy Award nominations received, it makes what has been a well documented troubled, delayed and hellish shoot all the more worth it, especially as it is almost certain to take home a few golden statues this year. 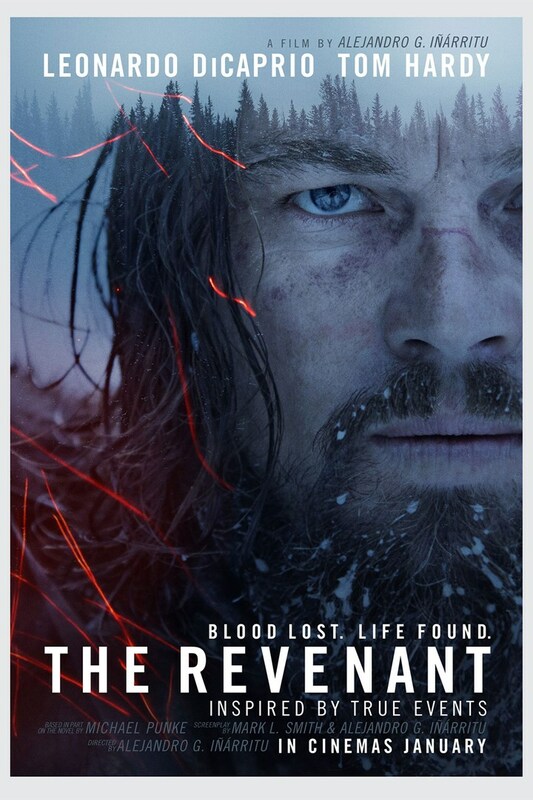 This frighteningly true story focuses on DiCaprio’s Hugh Glass who is part of a fur trapping expedition in the USA and after being brutally attacked by a bear protecting her cubs, he’s left behind principally by John Fitzgerald (Tom Hardy) and left to die, except he doesn’t die, and after personal tragedy, he’s now on an angry quest for revenge, as well as a difficult struggle to survive the severe force of nature, that is well, nature. The bitter cold that the characters find themselves in almost filters its way through the audience as the incredible cinematography makes the audience feel as if they are in this perilous and horrendous situation that Glass in particular finds himself in. It’s a chilling 156 minute tale. The aforementioned cinematography is simply flawless, and is almost certain to bag a hat-trick of Oscars for DP Emmanuel Lubezki after winning for Gravity and Birdman. The decision to use natural lighting was a masterstroke, giving a real look of authenticity and the film is visually magnificent with more than a handful of spectacular shots that will take your breath away. It is without a doubt one of the most visually impressive movies that has ever been made. Through all the stunning cinematography, there are a handful of really unpleasant and brutal scenes, namely the bear scene. It is a tremendous visual achievement, and is gripping to watch, but also equally disturbingly realistic and gory. The performances from all of the cast are all excellent but the two that stand out by far are those of Tom Hardy and Leo DiCaprio, the latter of whom really threw himself into the role, to the point where he must have got hypothermia on several occasions. You watch with suspense as he crawls across the landscape, driven by a fierce desire for revenge and the sheer will to survive against the uncompromising force that is nature. You root for him and you want him to succeed and again, it could be the role that finally lands DiCaprio the Oscar at the sixth time of asking, and also gives Hardy a decent shout at getting his first statue. Hardy is also equally mesmerising as the film’s villain, yet there were times when he was very difficult to understand, often reverting to his sort of trademark mumble. Will Poulter and Domhnall Gleeson, who has had quite the year after Ex Machina and Star Wars, are also tremendous. Yet this is the DiCaprio show, and he totally owns it. The violence on show here is pretty intense and certainly not for the faint of heart, yet for all the production problems, rebellion by the crew, and the delays to the shoot, which forced Hardy to drop out of this year’s Suicide Squad. Their efforts paid off, in a big way, with an equally tremendous score to go with it. It is uncompromising, brutal, and one of the best movies of not only the past twelve months, but this decade and one of the most riveting pieces of cinema you will ever watch. Visually magnificent, with tremendous performances from DiCaprio and Hardy in particular, this is an incredible film-making achievement and is not to be missed.